This year robots took over my life. It's not just my book project, which is centered around robots that explore the universe, but also in my home. We got a Roomba, a couple of Nest thermostats, and an Amazon Echo and a few Dots for different rooms. Each of these devices has had a significant, positive effect in ways I never expected. Moreover, they've become weirdly anthropomorphized and are all but members of the family now, or at least, really interesting houseguests that refuse to leave. I knew I'd love the Roomba from the very first time I learned they existed, so maybe my expectations were simply set that I'd like it no matter what. We call her—it—Margaret, after my beloved dog who died a couple of years ago. Margaret was always—always—at my feet, and the Roomba, for whatever reason, always seems to start her vacuum cycle in the kitchen, where I'm usually to be found standing around. In other words, she would bump into my feet as if to get my attention. The joy of the machine, though, is the way she—it—I'm just going to stick with she—can be either programmed for specific times, or activated manually when I'm away from home. It's hard to describe the Marie-Kondo-like Zen that overtakes you when you come home to very clean floors. Previously, I'd vacuum regularly, but it's never enough when you have kids and a cat. (I'm allergic to cat hair.) Our beloved Margaret, though, is always on the job, and dirt and dust and dander never has a chance to settle before being sucked away. This means that while it lacks the out-and-out power of an upright, it keeps the floors clean through sheer attrition. Not that it isn't powerful. This model (a Roomba 990, I think) is surprisingly heavy and its suction apparently very, very robust. Moreover, its storage canister is quite large, meaning it can easily vacuum most of the first floor of the house with little difficulty. Its design is ingenious. I particularly like the propellor-like sweeping brush that reaches every little cranny of the house, along baseboards and beneath cabinets, the feet of chairs and table legs, and so on. Uprights don't do that, and uprights can't vacuum beneath the furniture. Margaret can. She gets stuck on occasion. Our sofa is high enough from the ground in front that she can get under there and do the job, but the back of the sofa is a shade too low, and angled such that she can sometimes get wedged in there. I've since blocked this danger zone with a heavy marble beam that I had lying around from a remodel. It's hidden from view, and the Roomba touches it and turns around. Problem solved. There's not quite as much to say about the Nest thermostats. I mean, they're thermostats—let's not get crazy. Of note however is how effectively they urge the user (my household in this case) to conserve electricity. When nobody is home, the air conditioners switch into eco-mode, which basically means they do not run. When people are home, because they are so responsive and easy to manipulate with smart phones (more on this below) and even the Apple Watch, it's so convenient to just say, "Ah, no one is upstairs. I will set the air conditioner to 80, or heater to 50." I particularly like the monthly emails that not only give you an "eco rating," but compare your household with others in the area. The thing that has most changed our lives this year is the Amazon Echo, and Alexa, the artificial intelligence within. Alexa is wonderful. Alexa is everything that Siri promised to deliver, but never did. (Number of times I accidentally trigger Siri on a given day: 5,000. Number of times I want to trigger Siri: maybe 1, previously: "Siri, set a timer for 5 minutes"—a task supplanted by Alexa.) The problem with Siri is that she's just not really good at anything. Sports scores, I guess? Apple seems really proud of Siri's ability to tell you the score of the big game. "Siri, what is the score of the Saints game?" but if I have to take my phone out anyway, I'll just call that up on an app and get all sorts of great contextual information as well. Siri in a perfect world would be able to replace the announcers at sporting events. At present? She's just a slower way of getting staid information. Alexa is most powerful when she is ubiquitous. We started with an Echo in the living room / kitchen. (It's an open floor plan.) You just say out loud, though not loud, really—you can whisper to her—"Alexa set a timer," and she sets a timer. (We do set a lot of timers, I guess. Cooking, homework, etc.) And you say things like "Alexa play NPR" or "Alexa play Frank Sinatra," and the whole thing is just so convenient, so good, so transparent that you find yourself talking to her like she's some really smart and plucky servant. "Alexa, how do I spell Cincinnati?" Or, "Alexa, play some study music." I've written previously about my love of Christmas music, and Christmas Traditional Radio on Pandora in particular. Guess what? "Alexa, play Christmas Traditional Radio on Pandora." And she does, and it's wonderful. And she can control that too. "Alexa, I don't like this song" or "Alexa, turn up the volume." She also controls the Nest thermostat. "Alexa, set the hallway thermostat to 75." Alexa, what's on my calendar today? Alexa what's the high? Alexa, play Jeopardy! (really). The real power of Alexa is the way she can interface with other applications or devices. There's the Nest thermostat, but also things like Wunderlist (which I live out of)—"Alexa, add 'Write a blog post' to my to-do list," and there it appears—or with my car's computer system. "Alexa, lock my car." One thing I never thought I'd use, ever, ever!, but find myself using quite often is the Alexa's shopping capability on Amazon. We always run out of coffee. Now when it's low, however: "Alexa, order more vanilla biscotti flavored coffee." / "Your order history says you previously ordered Folgers Gourmet Selections Vanilla Biscotti Flavored Ground Coffee, 10 Ounce. It costs $4.73. Would you like me to order it?" / "Yes!" And she does. Two days later it's waiting for me, courtesy of Amazon Prime and FedEx. Eventually Alexa proliferated across our home. This works really well with Amazon Music Unlimited, which I feared would only allow a single stream at time, but seems to have no limit. People in different rooms can listen to whatever they want. Does it do everything I want? Not yet. There are some pretty obvious things that I wish would be implemented soon. "Alexa, play Christmas music on all of my Echoes." That doesn't work. The devices, as best I can tell, have no knowledge of the existence of each other, even when they're on the same wifi network. "Alexa, find a Christmas movie and send it to my Fire TV*." She doesn't do that, either, again, because she has no knowledge of other Amazon devices. "Alexa, set the alarm on my daughter's Dot for 6:15 a.m." Again, no dice, because she has no idea that other devices exist. The only other shortcoming I can think of is that she's not very good at carrying on a conversation. Once you issue a command or ask her to do something that she cannot, she's done. And you have to start over. "Alexa,...", "Alexa,...", "Alexa,..." It's a little too much like talking to a distracted child. It forces you to be a little too condescending. The beauty of Alexa is that she's more like a friend or a companion. When you have to keep demanding her attention, the balance of the "relationship" is thrown a bit off. I expect these oversights will be solved eventually. I'd also love to be able to use them as a kind of intercom system—"Alexa, call my daughter's Dot." But features are added every month, and other companies seem pretty good about writing apps for Alexa, so I suspect the wait will not be long for these abilities and others that I've not yet considered. In total, these things have had a really positive effect on our home. The Roomba was expensive, there's no getting around that, as were the Nest thermostats, though all of their prices seem to have plummeted during the Thanksgiving shopping holiday. The Echo was $179 when I bought it, which turned out to be an absolute steal not only for the features, but because the speaker on that thing is Bose-like. Just extraordinary sound quality. The Dots were $39 over the holiday, and we picked up a couple. I intend to get more when prices fall again. Are there privacy implications for all of this? Yes, with an asterisk. 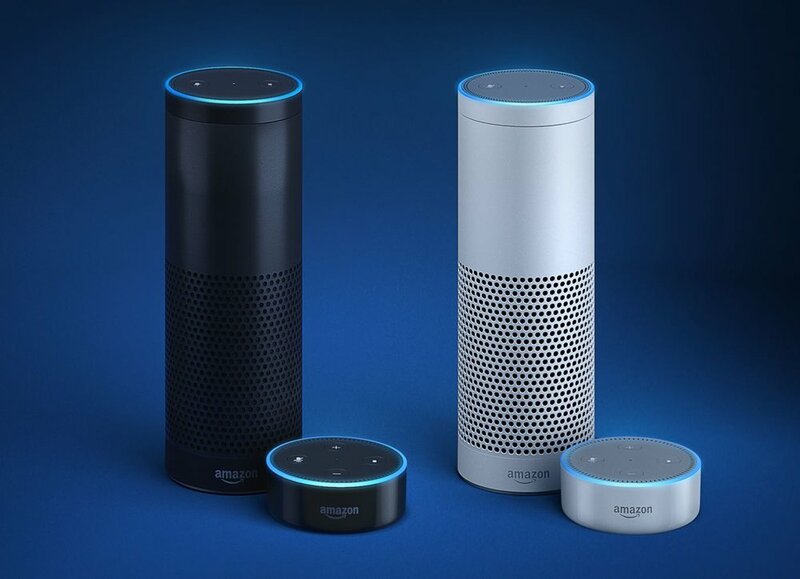 The devices do not open connections with Amazon until you say, "Alexa." And as mentioned previously, she's a little too quick to stop listening. Could she be hacked? Could be be recruited by the NSA to learn the intimate details of my life? Probably. But considering the number of computers, smart phones, video game systems, tablets—even my cable box!—that have "always listen" capabilities, the truth is if They, however you define They, want to listen, they already can and already are. Amazon has a really good track record with security, and I'm going to place my trust in them until they give me a reason to do otherwise. * Regarding the Fire TV: One thing the awesome convenience and utility of Alexa has done is brought us firmly into the Amazon ecosystem. We long ago gave up on the hokey Apple TV. There were too many apps that we wanted to try, such as Sling TV, Amazon Video, or FeelIn, that were denied on the Apple TV because the system was closed. (It has since opened up, though we're too far gone to look back.) We switched to Roku—we got one for free from Sling TV for giving it a try (we didn't stay with it because it lacked a couple of the very few channels we actually watch). Roku is wonderful! But Fire TV does everything it does, and also interfaces nicely with Amazon Music Unlimited, and Photos. So we invested in one. So far I'm pleased. I'm not a big TV person in general, but the device (the Fire TV, not television in general) hasn't yet offended me, and is smooth and light compared, again, with the clunky Apple TV (version 3, the last we tried).